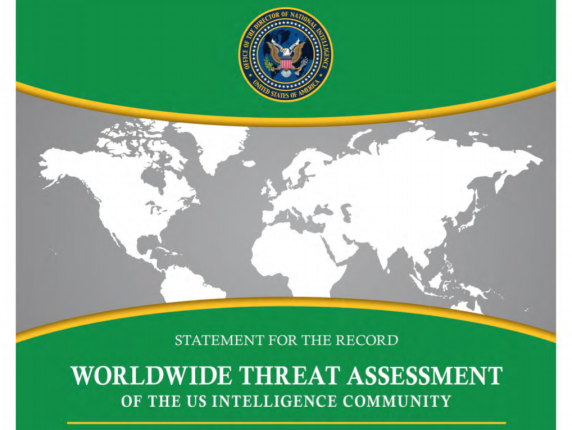 While Coat’s 2019 National Intelligence Strategy (NIS) only briefly addressed environmental security concerns, the inclusion of climate change security in the Worldwide Threat Assessment suggests that the U.S. intelligence community has not completely forgotten about water and food insecurity or extreme weather. First, the report mentions human displacement as a security issue but does not provide any reasons for the mass and record high migration. It then goes on to warn of extreme weather events, high temperatures, and diminishing Arctic sea ice along with the potential for increasing water and food insecurity, accelerating sea level rise, and increased competition over access to sea routes and natural resources. Although many environmental threats and potential outcomes are listed, the specific focus is on extreme weather events that can “affect urban coastal areas and damage communication, energy, and transportation infrastructure” as well as “changes in the frequency and variability of heat waves, droughts, and floods increasing the risk of social unrest, migration, and interstate tension.” The report also covers Arctic issues, such as increased competition between China, Russia, and the United States over access to sea routes and natural resources as sea ice melts. The decision to widen the scope of perceived environmental threats suggests that the intelligence community has chosen to take a more comprehensive position on climate change than the current administration. Climate change is not the only subject of contention between the U.S. intelligence community and the White House. By warning of its threats and the consequences of global warming in this national report, the intelligence community took a direct stand against the current administration. Their Worldwide Threat Assessment acknowledges how intertwined these environmental issues are and the undeniably greater impact they can have on America’s national security. Isabella Caltabiano is a research assistant at the Wilson Center. A detail assessment presenting the climate change facts on the global dangers humans are facing. Life is become very insecure for everyone.